Historically, Bangladesh is a land of glorious cultural heritage with inter-religious harmony and co-existence being the inherent characteristics of the soil. Buddhism entered in ancient Bengal more than 2,000 years ago and it continued as the predominant religious faith in the region until about the 11th Century AD. Ruling dynasties patronized Buddhism successively for nearly seven hundred years in the ancient Bengal and the adjoining kingdoms in the eastern India. As a result, Buddhism made deep influence on Bengali life, culture and civilization. At the moment, Buddhists are the third largest religious community in Bangladeshwho are devoted to their religious rites and tradition. The prominent Chinese pilgrim –traveler FaHien, who toured ancient Bengal and other parts of Indian for 16 years in the seventh century (629-645 AD), noted that Buddhism was flourishing in the northern and central parts of present-day Bangladesh. His travel diary recorded about 30 monasteries in this part of ancient Bengal. Travel records from Chinese pilgrims helped provide clues for archeologists to uncover the lost Buddhist heritage sites. A number of important Buddhist archeological sites have already been uncovered in different parts of Bangladesh. Bangladesh is believed to be a rich repository of South Asian Buddhist heritage. In order to draw world’s attention to rich Buddhist heritage in Bangladesh, the Government organized an international event in collaboration with World Tourism Organization in October 2015. The most prominent Buddhist monument in Bangladesh is the colossal monastery at Paharpur known as Sompur Mahavihara in the northern district of Naogaon. This is the second largest single monastery in the south of the Himalayas. The Monastery was built by the second king of Pala dynasty Dharmapala in the 8th century AD. According to Tibetan sources, Sompur Mahavihara in Paharpur was one of the five greatest Buddhist monasteries in ancient time. The world famous Buddhist scholar Atish Dipanka Srijnan (11th Century) stayed at the Mahavihara for many years. Sompur Mahavihara has been designated as a World Heritage Site by UNESCO in 1985. The site covers an area of 27 acres of land that includes a quadrangular court measuring more than 900 feet each side. The external walls on each side stand about 16 feet in thickness, and measure 12 feet to 15 feet in height. The total complex of 177 rooms has 45 rooms on the north side and 44 in each of the other three sides. The excavated findings have been preserved at the Varendra Research Museum in Rajshahi. It is called the Seat of the Lost Dynasties, which lies in a range of low hills in Comilla district beside the Dhaka-Chittagong highway. The whole range of hillock runs for about 18km and is studded with more than 50 sites hosting the Buddhist civilization of 7th-12th century AD. At Mainamati, the principle monument is the Shalban Vihara. The Shaban Vihara is in the middle of the Mainamati range and consists of 115 small rooms surrounded by 4 walls where Buddhist monks used to study and observe religious practices. Shalban Vihar was built by the King of Buddhist Deva Family Bhabadev in the 8th century and the same survived for 400 years. Another important Buddhist temple, named Tri-Ratna Stupa, is found about 5 km away from Shalban Vihara. This Stupa is the symbol of Tri-gem of Buddhism: Buddha, Dhamma & Sangha. Ruins of numerous other Buddhist viharas and temples such as Charpatra Mura, Boiragir Mura, Kotila Mura, Ananda Vihar, Voge King’s Mura, the Vihar of Rupban Kanya, Aduna-Paduna Mura, Pacca Mura, Kotebari have been found in the vicinity of Shalban Vihara. 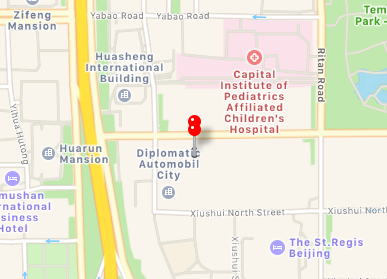 Numerous artifacts such as copper plates, gold and silver coins, jewelry, pottery, utensils, stupas, and more than 150 bronze statues as well as a large number of stone sculptures and terra-cotta plaques have been found in this site. A site museum houses the archaeological finds. Mohasthangarh, situated about 13 km north of Bogra town, is an ancient fortified city acclaimed to be the one of the oldest urban-style settlements in entire Bengal. The oldest layer dates back to 3rd century BC. The ancient Pundranagar, the capital of Emperor Chandragupta, the founder of Moyura dynasty, was located here. The city continued flourishing during a few successive Hindu and Buddhist dynasties. Beyond the citadel, other ancient ruins found within a radius of about 8 km which testify the existence of extensive suburbs. The whole area is rich in Hindu, Buddhist, and Muslim sites. The Buddhists were here until at least the 11th century. Their most glorious period was the 8th to the 11th centuries, when the Buddhist Pala emperors ruled the area. Most of the uncovered remains of the site including brickwork belong to this Buddhist era. The rich archaeological museum of Mohasthangarh has got rare collection of antiquities, gold ornaments, coins, and terracotta objects with many other relics recovered from the site. This site, locally known as Narapatir Dhap, is situation at about 6 km north-west of Mahasthangarh. Initial excavations unearthed two large Buddhist monasteries and a medium-sized Buddhist shrine. Dimensions of the larger monastery are 56 meter in North-South and 49 meter in East-West with 30 monastic cells in 4 wings around a square shaped courtyard. Dimensions of the smaller one are 49 meter in North-South and 46 meters in East West with 26 monastic cells in 4 wings. Both the monasteries have similar design. The North facing cruciform shrine stands not far from the monasteries. It measures 38 meter in North-South and 27 meter in East-West. The mandapa or assembly hall occupies the center of the shrine. Subsequent excavations revealed a small monastery consisting of 37 small rooms. At this site, around 800 artifacts (ornamental bricks, semi-precious stone, terracotta beads, iron nails, oil lamps, etc. ), a number of bronze statues and terra-cotta plaques have been found. 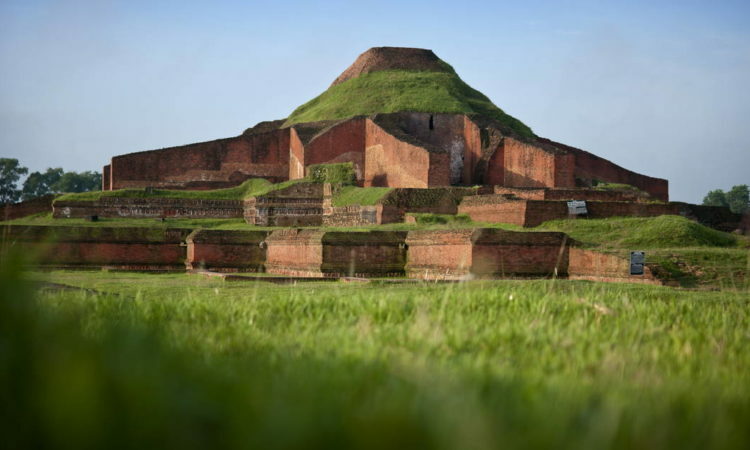 The Halud Vihara, an early Medieval Buddhist site, is located about 15 kilometer south-west of the World Heritage Site of Sompura Vihara at a small village of Dwipganj in the northern district of Naogaon. The excavations revealed the remains of a temple complex consisting of a solid square structure with 5.80m sides which probably was the base of a stupa; two unequal oblong rooms; a staircase, and part of the enclosure wall of the complex. Of the two rooms, the smaller room is believed by excavators to have been the; while the larger one was intended to be a mandapa, assembly hall. The site is yet to be excavated fully. There are many scattered ancient monumentsall over the village which suggest that the site is a remain of a flourishing ancient Buddhist settlement. So far, a number of utensils, stone objects, metal images, terra-cotta plaques and ornamental bricks have been found. Artifacts found at this site is very much similar and coeval to those found at Sompura Vihara. Preliminary findings offer encouraging prospects for further sustained operations. Bangladesh Government’s request for inscription of the site in the UNESCO World Heritage List is pending. After four years’ effort, a Buddhist monastery was completely unearthed by March 2013 at this site in Dhaka district. More than 100 statues and sculptures have been found in the monastery site. According to researchers, the site is related to Atish Dipankara Srijnan (980-1054), a renowned Buddhist scholar who was born in Bikrampur. According to some archaeologists and experts, the Vihara in Bojrojogini village of Bikrampur, is one of the 30 monasteries built by King Dharmapala (820 AD), the second king of Pala dynasty. Recently, the remnants of an ancient urban settlement dating back to 450 BC have been discovered at Wari-Bateshwar region of Narsingdi district near the old course of Brahmaputra River. Nearly 50 archaeological sites have been indentified in this area. Discovery of this site, at about 70km North-East of capital Dhaka, challenges the earlier notions of early urban civilization in Bengal. Before the discovery of this site, the widely held view was that urbanization occurred later than the Wari-Bateshwar ruins indicate. One Buddhist temple was found at about 4km away from Wari-Bateshwar at Mondirbhita villa of ShivpurUpazila. In another nearby village named Jankhartek, a relatively bigger Buddhist temple was found. Such findings suggest that the residents of Wari-Bateshwar were Buddhists. The discovery of a pit-dwelling is the first of its kind in Bangladesh. People used to live in these small ditches. The pit-dwelling is a Copper Age or Chalcolithic artifact. Similar pit-dwellings have been found in India and Pakistan which are believed to be 4000 years old. A wide variety of artifacts have been found in these areas. There are a number of magnificent modern-era Buddhist temples in Bangladesh. The Golden Temple at a hill top in Bandarban district is probably the most charming Buddhist temple in Bangladesh. Gigantic Buddha status in Dhaka, Chittagong and other parts of Bangladesh are special attractions for the devotees and tourists. There are also a number of Buddhist learning centres and pilgrimage spots in Bangladesh.